Mommy Jane's resolution for 2017 is for the family to stay healthy. A healthy family is a happy family. 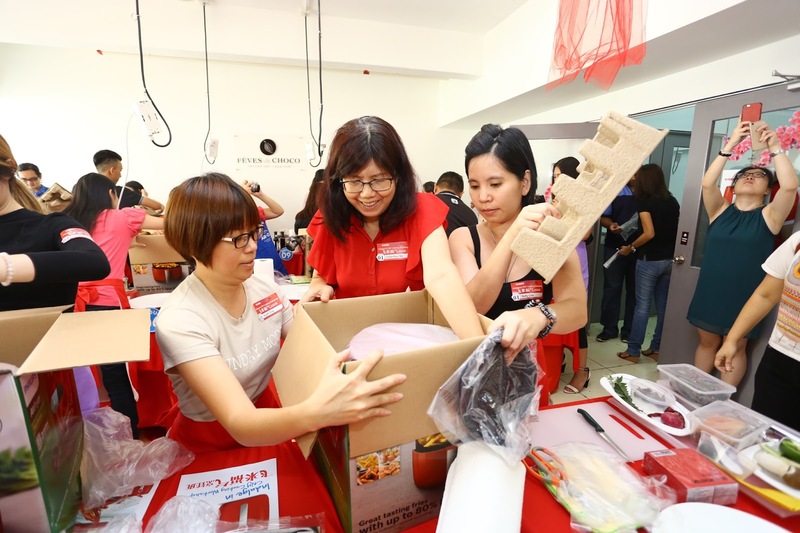 To start the initiative, we'll do some exercise in the morning especially on weekend, making our own bread using a bread maker as breakfast, getting some vitamins supplements and having a Airfryer to prepare a healthy meal for my Little Angels. 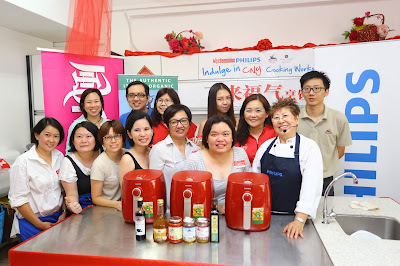 To ensure the meals are healthy and delicious, Mommy Jane had attended a cooking workshop using a limited edition red colour Philips Airfryer (HD9623/31) with Chef Amy Beh and Philips Malaysia at Feves De Choco on last Saturday afternoon. 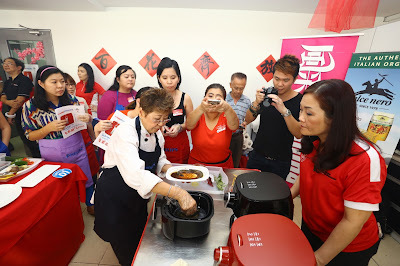 Since Chinese New Year approaching soon, Philips Malaysia had collaborated with celebrity, Chef Amy Beh and Feminine magazine to introduce the healthier versions of several familiar traditional dishes made using the Philips Airfryer with new TurboStar technology. The 3 dishes which are the favourite amongst Chinese i.e. "Siew Yuk" and must to have dishes during the festival i.e. Prawns and Fish. Prawns signify happiness and Fish signify abundance. "Chinese New Year is a time for families and friends to gather and spend quality time with each other, while wishing each other prosperity and a good year ahead. The annual Chinese New Year reunion dinner with its menu of traditional Chinese dishes is especially significant for all generations of the family. 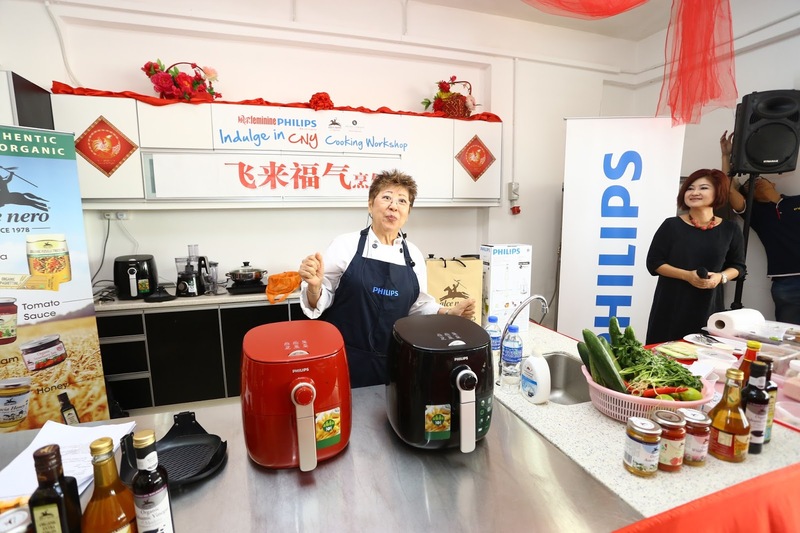 However, those that are health conscious may be concerned that traditional Chinese dishes are often saturated in oil and unhealthy fats," said Muhammad Ali Jaleel, Chief Executive Officer of Philips Group of Companies in Malaysia. "Philips is dedicated to improving people's lives through meaningful innovation, and this includes innovating convenient and time-saving appliances that help consumers prepare healthier meals. For Chinese New Year, we are collaborating with Chef Amy Beh to demonstrate how familiar Chinese dishes such a spring rolls and steamed chicken can be recreated with a healthier twist without compromising on taste using the Philips Airfryer equipped with new TurboStar technology." 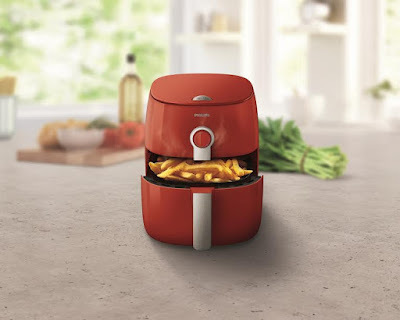 Armed with TurboStar technology, the Philips Airfryer TurboStar is the latest in the Philips range of airfryers that helps consumers to eat food that is less oil but not the taste when cooking. Philips Airfryer can help us to prepare a complete and healthy Chinese New Year dinner from roasted pork to steamed chicken and spring rolls for this coming Year of Rooster. After the speech from the representative from Philips Malaysia, Chef Amy Beh showed us on how to prepare and cook tong kwai flavour roasted pork, tamarind honey prawns and grilled spicy fish with wonder mushrooms. All these 3 dishes were Mommy Jane and Little Angels' favourite dish. Me, Ivy from Food Malaysia and Feminine Reader, Julia Chan had formed a team of 3 members to work together to prepare the 3 dishes. All of us had tried our best to be as creative as possible in the hope to bring home the Philips Airfryer. 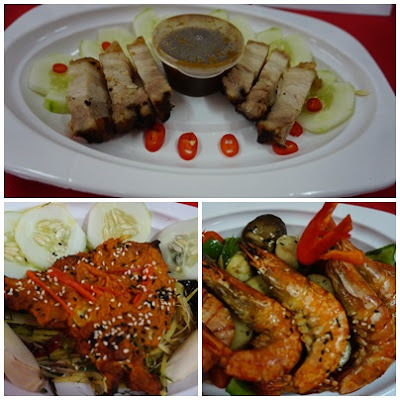 Our dishes as follows and we named our dishes as "Pork Pork Chui" for the "Siew Yuk", "Auspicious Flying Fish" for the Grilled Spicy Fish and "Asam Ha-Ha Prawn" for our Tamarind Honey Prawn. Philips Airfryer TurboStar comes in a more compact design that offer great tasting fried food cooked with up to 80% less fat. Just fry with little or no oil and it produce food that is crispy on the outside and tender on the inside. The TurboStar technology also cooks fried food 50% more evenly and faster with no turning needed. In conjunction with Chinese New Year, Philips has released a limited edition red Philips Airfryer (HD9623/31 to liven the kitchen with the festive colour. If you opt for digital versions, HD9640 price at RM1,399 and HD9643 price at RM1,499. It is available at any Philips authorised retailer nationwide and Philips Official store at www.blip.my or Lazada at www.lazada.com.my/philips-official-store. 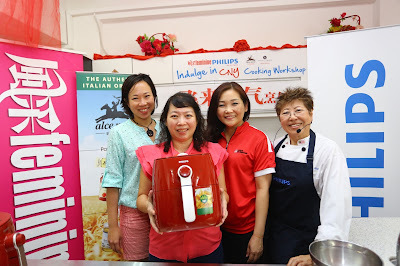 Thanks to Philips Malaysia for the invitation to join the CNY dishes cooking workshop together with Feminine Magazine and Alce Nero. Mommy Jane had learned some cooking skill from Chef Amy Beh. The happiest moment is when Mommy Jane's name was called out as the lucky winner to bring home the limited edition red Philips Airfryer. Times to stay healthy now but cooking less oil food. With Philips Airfryer TurboStar, Mommy Jane is more confident to prepare a healthy and delicious meal now for my Little Angels. i saw this recently, but didn't buy it yet coz am still saving money, hahaha. But I like this airfryer because its cost effective. Did you take home one? What a nifty machine. I think it is every household's dream to have it on their kitchen top! Indeed, a healthy family is a happy family. Emily, agreed with you. My dream to have one too and thanks to Philips Malaysia for organising this. Rawlins, truly agreed with you and to stay healthy too. Shrivani, thank you. Philips Airfryer TurboStar is indeed a good investment to stay healthy. Heard a lot of good feedback about this product. Wish to grab one for myself. Shini, you should. Your kitchen will stay clean and you can have a healthy and nutritious meal after having this. Congrats Jane, this CNY i go to your house eat ayam goreng sedap sedap okey. Kelly, no problem. Will use the Airfryer to cook a healthy meals for you. Qian, it is indeed a good investment to stay healthy. Miera, save money to get one for a healthier meal. You won't regret on this investment. They help to prepare the food without much labor and expertise and even enhance the taste. The dishes are now available as a complimentary accessory along with the microwaves.